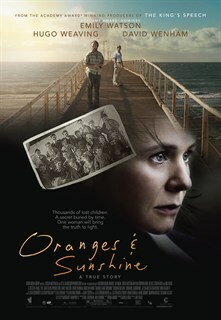 Oranges and Sunshine tells the unforgettable true story of Margaret Humphreys, a social worker who uncovered one of the most controversial scandals in recent times: the organized deportation of innocent children from the United Kingdom to Australia, where they were thought to be lost in the system forever. Almost single-handedly, against overwhelming odds, and with little regard for her own safety, Humphreys reunited thousands of families and brought worldwide attention to a corrupt system and an extraordinary miscarriage of justice. Academy Award® nominee Emily Watson (Breaking the Waves, Punch Drunk Love) stars as a woman whose quest would challenge the leaders of two nations, and force them to confess to a secret as stunning as the truth it revealed.